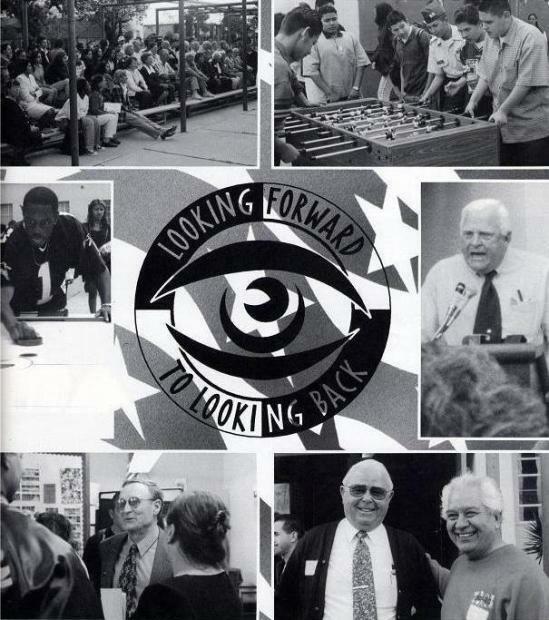 On March 5th 1998, alumni from as far back as the 1930s gathered together with students and staff to take a look at the impressive history of Leuzinger High School. A comprehensive, decade by decade display of photos, trophies, yearbooks, and momentos were on view in Room 106, and a formal dedication of Alumnus Jimmy Akinson's library mural took place at 11 o'clock. Lawndale Mayor Harold Hoffman - Class of 1950 plus the legendary teacher Coach Donald Cameron were among the featured speakers. Special thanks went to Mr Suarez, Mr Furutani, and The PTSA for organizing this event. TO SPEAK TO THE STUDENTS IN THE CLASSROOMS AT LEUZINGER. Leuzinger's Teachers, those who can attend, will also be at the meeting. You will not want to miss it. Hope to see you there. Joyce.